The Modero 30 in. vanity has a simple clean design with a chic Chilled Gray finish and brushed nickel hardware. It is constructed of solid poplar wood and veneer with soft-close doors and drawers that showcase its quality. Match it with the natural beauty and durability of a stone top and you create the perfect vanity ensemble. The Brentwood 25 in. vanity features a new luxurious walnut finish with a transitional styling that would compliment any bathroom. Hand-crafted out of solid poplar wood and elm veneers, wood-matched design soft-close doors and antique nickel door knobs. Add understated elegance to your bathroom with the Delano Collection. Spare in style, we designed Delano to accent a range of bathroom dicor, blending simple beauty with unmatched versatility. Whether you choose the Taupe Glaze or White Finish, the 30-inch Delano features a durable solid wood frame and sophisticated black bronze pulls, 1 flipped down DWR and 2 functional DWRs. Pair Delano with one of our natural stone tops and matching mirror to create the bathroom of your dreams. A contemporary Grayish Blue finish accents the elegant detailing and solid poplar construction of the Kelly 30-inch vanity. Kelly's furniture grade styling and generous storage space can be paired with the matching Linen Tower, providing ample practicality and panache to your bathroom space. Add a handsome and sturdy stone top to complete your vanity set. Modero 30-Inch Vanity Cabinet in Chilled Grey The Modero 30 in. vanity has a simple clean design with a chic Chilled Gray finish and brushed nickel hardware. It is constructed of solid poplar wood and veneer with soft-close doors and drawers that showcase its quality. Match it with the natural beauty and durability of a stone top and you create the perfect vanity ensemble. 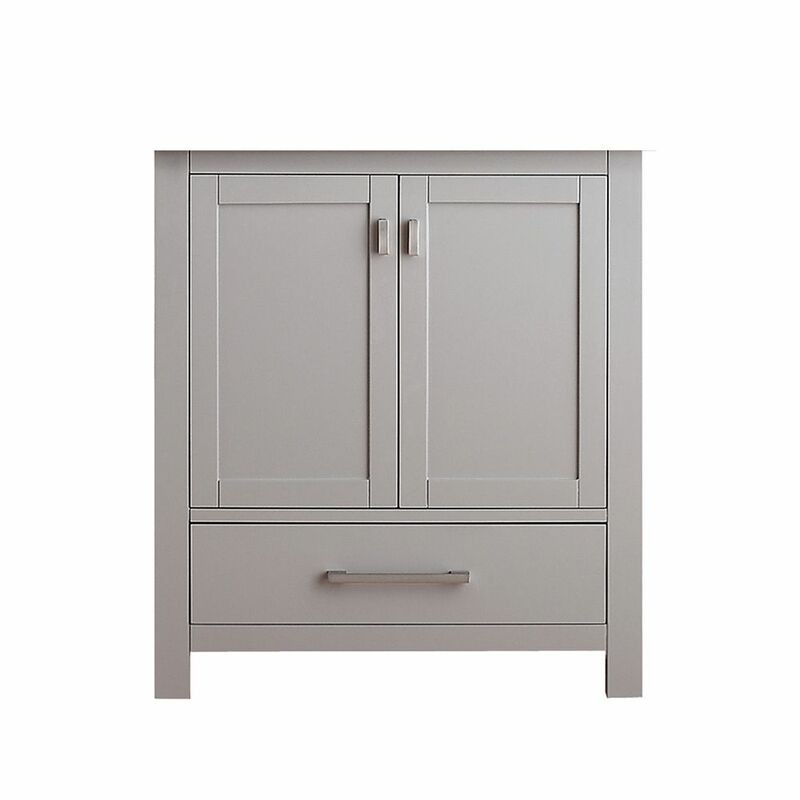 Modero 30-Inch Vanity Cabinet in Chilled Grey is rated 4.4 out of 5 by 7. Rated 4 out of 5 by HomeDepotCustomer from I thought it was expensive but it is solidly built. I have had it for 30 days with no problems. ... I thought it was expensive but it is solidly built. I have had it for 30 days with no problems. Can't think of any enhancements I would recommend. I am happy with the purchase. Rated 2 out of 5 by ELoz from Visually stunning piece. Real wood. Very cool hinges that prevent loud door/drawer closes. Would ... Visually stunning piece. Real wood. Very cool hinges that prevent loud door/drawer closes. Would have easily broke a 5 star if that was it.. Took delivery on the 21st of June 2017, however, returning it (hence the low rating). One of the doors is uneven and rubs when closing and one of the legs was scarred from shipping. For a SEVEN HUNDRED dollar piece, that's just not acceptable. Rated 5 out of 5 by SAW from Beautiful cabinet! Although expensive, it's well made and worth the price. Beautiful cabinet! Although expensive, it's well made and worth the price. Rated 5 out of 5 by HomeDepotCustomer from Arrived in perfect condition. Easy to install. Looks great. ... Arrived in perfect condition. Easy to install. Looks great. Rated 5 out of 5 by Christine from Perfect Sink base Lovely sink base. The self closing doors are an added treat. Rated 5 out of 5 by Christine from Absolutely perfect I Love this Vanity. It was easy to install has beautiful lines and functions perfectly. Self closing hinges and drawer makes this vanity a class act. Rated 5 out of 5 by CLB from Beautiful solid hardwood vanity well worth the price It's so difficult to find a solid hardwood vanity, but well worth the higher price & somewhat longer delivery time. The Modero was easy to install and has great features like a self-closing drawer and lots of shelf space. It is solid and sturdy, and is finished beautifully. The vanity was well-packed and arrived in perfect condition. It looks gorgeous in my new master bath and is sure to last a lifetime. I'm thrilled with this purchase.